This is message from Fr. Joseph Pullikattil. We deeply regret to inform you that the "Thaikkudam Bridge" Fundraiser event scheduled for May 20, 2016 at East Catholic High School Manchester CT has been canceled due to some unforeseen delays and complications with travel Visas for some of the performers. We are hoping to reschedule the program for the last weekend in June (24, 25 or 26) but will only be able to confirm if we are able to do so by the end of next week (by May 27, 2016). We will make a full refund for all tickets bought so far without questions if you do not wish to attend the rescheduled the program in June (to be confirmed by May 27). If for any reason, we are unable to reschedule this program, we will issue a full refund for all tickets. We want to thank you for your support and sincerely apologize for any inconvenience this cancellation may have caused. Please feel free to email us at info@thaikkudamlivect.com if you wish to request for a refund or have any additional questions/concerns. Thanks again for your support! Our parish member Usha James's sister Lisy Kurien Mayiladoor (67) passed away yesterday in Kerala. Funeral will be held at Kadhalikkaadu Catholic Church on Friday. Please join us to convey our condolences and prayers to Joji, Usha, Michael and Michelle. 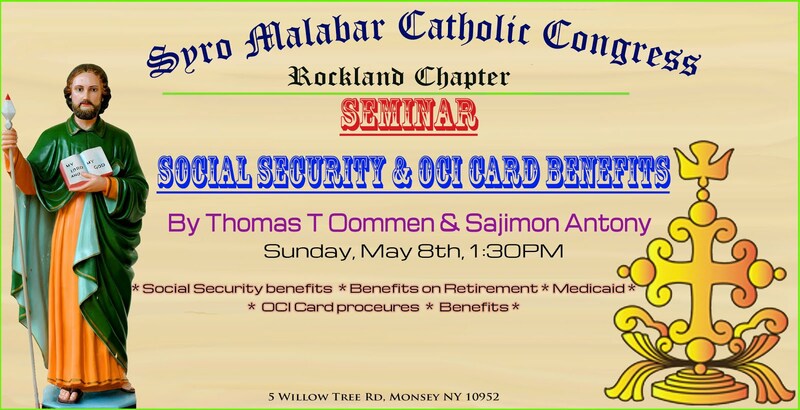 Please share and invite your friends and family to this seminar. SMCC conducting a SAT seminar on June 26th from 1PM to 3PM. The target of the audience is students from 8th grade to 12th grade. Mr.Jaison Thomas(NY certified Math Teacher will handle the seminar on Maths from 1 PM to 2 PM.He will cover the new changes and subject details. Mrs.Sara Leslie(NY Certified English Teacher will handle the seminar on English from 2 PM to 3 PM. She will also cover the new changes and subject details. The previous email about the choir practice was sent by error. Please know that there is no practice today. Little Angels Choir members who have participated, at least, one of the three practices are requested to come at 8 AM on Saturday (5/14/16) to the church for a final rehearsal before the 9 AM First Communion mass. Children should be attired in white top and black bottom. Thanks. Sunday - 1.30 pm to 2.30 pm. There is also a Latin English Mass today at 7.30pm. Our Parents Night Out is this Saturday from 6-9 pm. 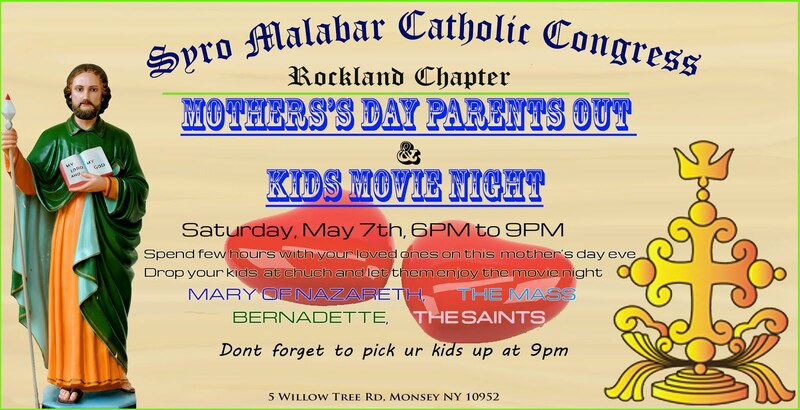 It is going to be an awesome night filled with fun activities and their favorite movies! 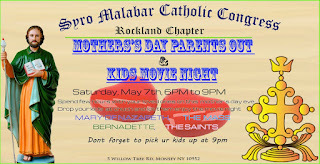 We will be having pizza and drinks and also making special mothers day gifts for all the moms :). 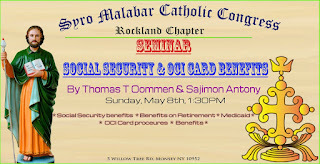 Reminder-"Social Security and OCI card benefits seminar"
This is a reminder and invitation to the "Social Security and OCI card benefits seminar". Please visit our blog to get updated information and comments. Little Angels Choir practice for First Communion mass will be held at church by Angela Argenzio and Sophia Manalil on Friday (5/6/16) 7 to 8 PM in class Room # 4. And, Sunday, (5/8/16) from 1.30 PM to 2.30 PM inside the church. Please be prompt.